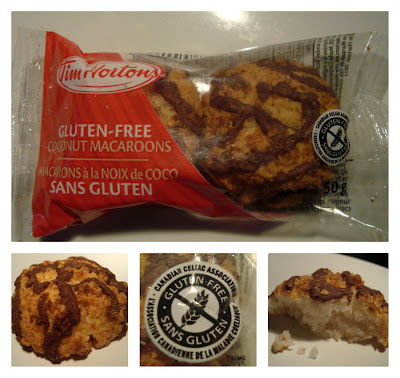 With all the talk of American franchise Dunkin Donuts offering an array of pre packaged Gluten Free goodies, you can imagine my delight when out of nowhere Canada's beloved Timmy's surprised us with Gluten Free coconut macaroons! Totally unexpected AWESOMENESS right?! Tim Horton's rolled this product out the right way - with Celiac customers in mind. A first of it's kind in Canada. It is certified Gluten Free through the Canadian Celiac Association's Gluten Free Certification Program and that is no easy feat. They have very strict policies that keep Celiac health a number one priority.Check my photo above for the seal of approval. Price point is $1.29 for a pack of two macaroons. That alone says that Tim Hortons cares as they are not attempting to nickel and dime us like most companies who venture into the Gluten Free world. Each package is individually wrapped and prepared off site in a dedicated facility. I would not consider myself a coconut fan but I really enjoyed the texture and flavour of this sweet little meringue style confection! The added bonus of a chocolate drizzle is just enough without going overboard. If you are not normally a sweets person, this is most likely not a product for you. They are small enough to fit in a purse or a small lunch bag while being packed full of flavour. Makes for an easy to take "just in case" snack for those adventurous moments where something Gluten Free may not be easily accessible. It's a great product for a treat and by treat I mean something that is consumed in moderation. Yeah, it's quite sweet so lets go there for a nano second - This is a snack. It is by no means meant to be healthy. Does anyone honestly walk into a donut shop and expect health food? I think not. So with that being said I applaud Tim Hortons efforts to create a Gluten Free item on their menu. We now have an option on the road. Seeing as there is a Tim Hortons on nearly every block and every major highway exit in Canada, finding these babies should be easy peasy. We drove to Florida last year and a certified option like this would have been a welcome convenience! I can imagine the joy of Celiac cottage goers as well. The website states that the Gluten Free macaroons are available for "a limited time" which is kind of disappointing. But I understand that they probably want to see how well it is received before they make any long term decisions regarding it. I for one am hoping that this product does well. If it does, perhaps we could see Gluten Free prepackaged muffins and donuts in our future. Thank you Tim Hortons for being Celiac friendly! *Disclosure : I was sent a free sample of Tim Hortons Gluten Free Macaroons. My opinion is that of my own and was in no way affected. Are these dairy free as well? Thanks! According to the Tim Hortons allergen chart the Gluten Free macaroons are free of Milk products. Tree Nuts and Egg are the only allergens listed.